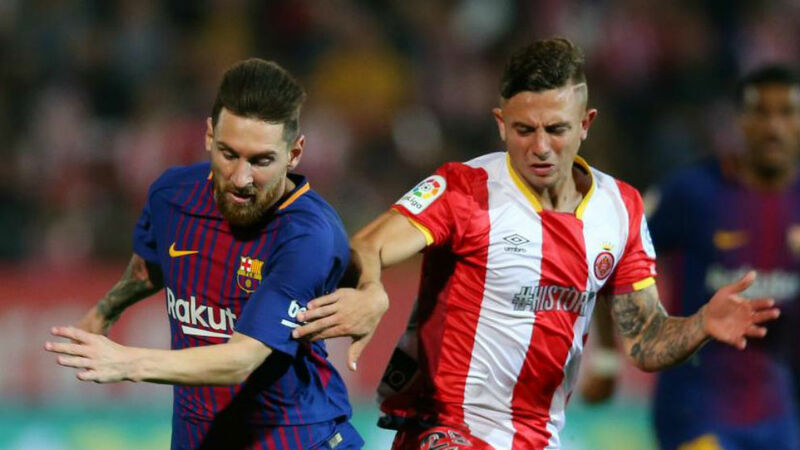 Barcelona enjoyed a comfortable evening as a team against Girona on Saturday night, but Lionel Messi was closely watched by Pablo Maffeo for the entire match and the Spanish defender even suggested after the full-time whistle that the Argentine had asked him his age and whether Manchester City had loaned him out. In a post-match interview, Maffeo revealed that the iconic forward had actually spoken to him during the match, asking him these personal details. “He [Messi] asked me a couple of things, like if I was loaned by City and how old I was,” the defender explained. The 20-year-old also explained the tactical intricacies of his job on Saturday evening, revealing that he’d been tasked with directly limiting Messi’s influence. “I had to mark him and I had to be close to him and not watch the ball,” he said. “It is difficult, not just from a football perspective, but also psychologically. Despite having been within touching distance of Barcelona’s top goalscorer for the entire match, Maffeo didn’t actually swap shirts with him; instead if was Marc-Andre ter Stegen whom he sought out. “A friend of mine wanted Ter Stegen’s shirt so I asked the goalkeeper,” Maffeo said. The two teams will, of course, meet again later in the season and it will be interesting to see how Maffeo is utilised on that occasion, as well as which shirt he goes home with.